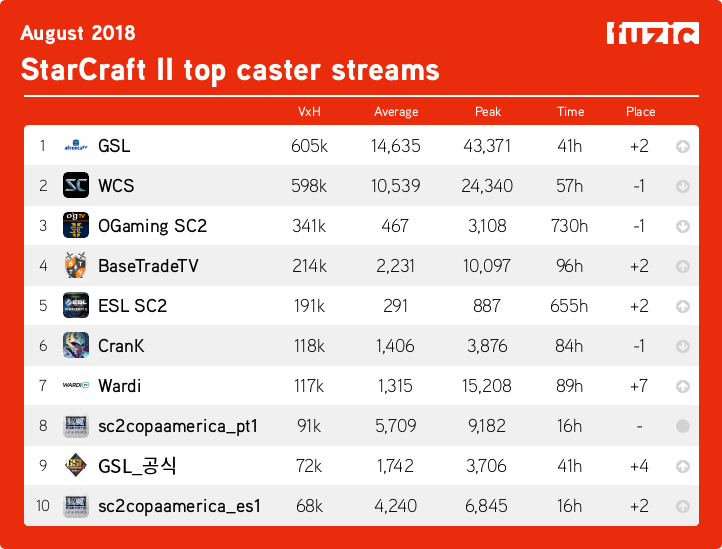 Read on for previous month's SC2 streaming statistics! Destiny's still going strong, and coming closer to that #1 spot every month. Will he break Winter's streak at the top spot? Playing the SC2 single player campaign seems to be something of a trend for Korean streamers; this month there's another newcomer, Hearthstone streamer 마스카, who cracks the top 10 doing just that. 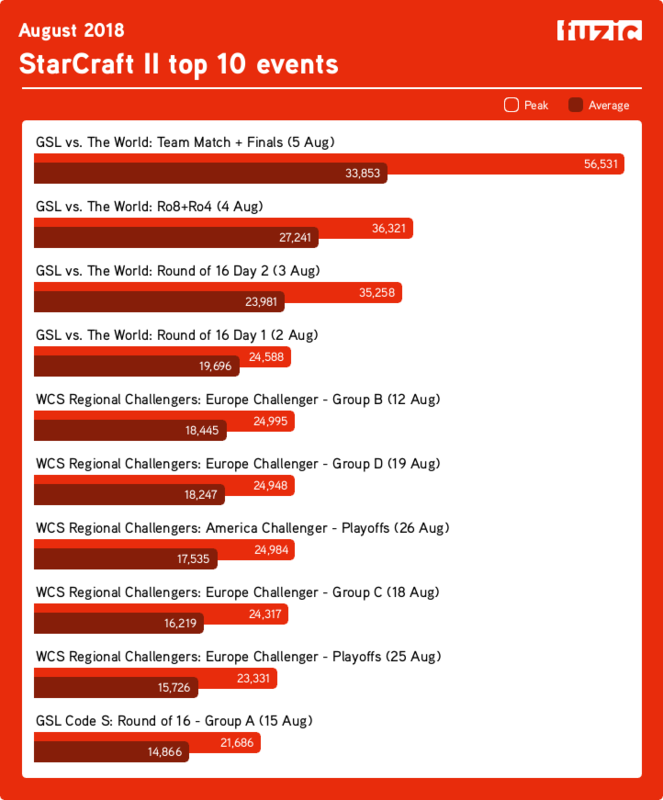 Thanks to GSL vs The World, which saw 56k people tune in for the finals, August's overall viewer numbers are comparable to July's. This is an improvement compared to last year, when the average dropped in August. Following MarlieChurphy's request last month, there's a BW Edition of this thread too now. Check it out if you're a fan of the first game! As always, suggestions and requests are welcome! 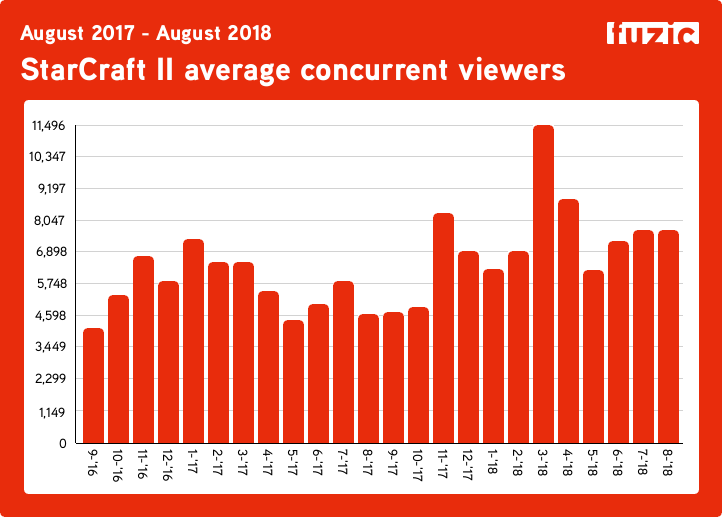 I run Fuzic - which collects statistics and rankings of StarCraft II live streams - and these threads are a summary of the viewer numbers for the past month. Data is sourced from fuzic, and additional up-to-date stats may be found there. But in these threads - which I will try to post at the beginning of every month - there will be a monthly summary so you can get a quick overview of that month's viewer numbers. 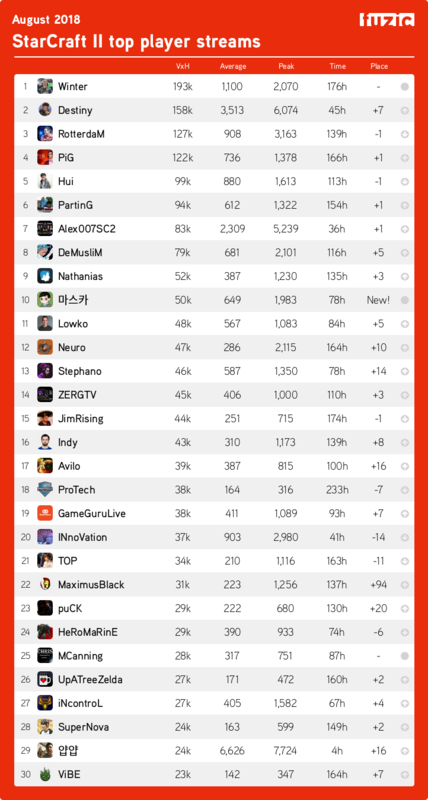 The rankings list any stream that is reported on by the APIs of the various streaming services (Twitch, Azubu, etc). I have no way of verifying to what extent someone's viewers are legitimate, and therefore will not independently ban someone from the rankings. Please do not start a(nother) discussion about this in this thread. "VxH", or "hours viewed" is the average amount of viewers multiplied by the amount of hours the streamer has streamed during that month. Basically, if for each viewer you count the amount of hours they watched the stream during the month, and add them up, you get this number. The list is sorted by this metric, as it gives a good impression of the streamer's activity through the month. You can click the links below the charts for additional stats and a list you can sort by whichever metric you prefer. No one came close to my hours streamed! Out of curiosity, why are the average concurrents for some months on this graph different from the average on the website? For example, a number of months in 2017 are under 3k here, vs showing over 4k when hovering over the bars on the site? It is very nice to see that WCS challenger is scoring so high. Again, 50% vape noises and an empty chair. Glad to see Demu back up there! Also Rotti holding strong. Thanks for noticing this! Turned out the individual bars in the chart were vertically stretched a little so they didn't align with the grid lines correctly. So they were still correctly proportioned relatively to each other (i.e. the overall trend remains the same) but didn't match the values in the Y axis' legend. This has now been fixed. My match history says I played 55 games in my stream today. thanks for taking the time and energy to compile and post this.